The Perfect Fit for Inbetweeners! Your head is not exactly round, nor exactly long oval! 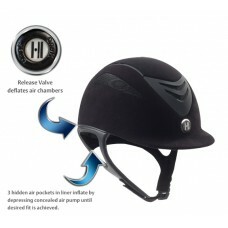 So how can One K Defender Air riding helmets be so adjustable? The secret is in the Air pump system that provides the ultimate in comfort & custom fit. The 3 hidden air pockets in the liner inflate by depressing its concealed air pump until you get the fit you want. The Defender Air Suede horseback riding helmet features a Chamude® synthetic suede covered Polycarbonate and Advanced ABS Composite outer shell; injection molded shell design; quick-dry, moisture wicking, anti-microbial liner; stainless steel mesh; comfort padded harness with synthetic suede lining, hook & loop adjustment, and Fastex buckle; two side, two front, one back, and two center stripe vents. The One K line of riding helmets boast the perfect synergy between advanced technology and aesthetically pleasing helmet design. With enough features to appeal to those seeking everything a riding helmet could possibly offer, wrapped in a package that traditionalists can appreciate, One K has the best of both worlds. Take a look at the full line of One K riding helmets (link to the main landing page), there is sure to be one to perfectly fit your needs. 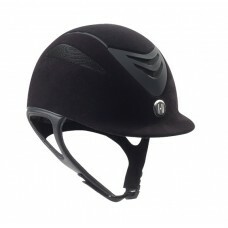 All One K riding helmets are certified to ASTM standards.